She loves me, she loves me not. She loves me, she’s not gonna say until Tuesday’s Apple Event, but golly gee whiz we love a good rumor. Or, a bad rumor, if that’s all we’ve got — less than clearly convincing spy pics of the iPad 5 and iPad mini 2 sporting Touch ID. 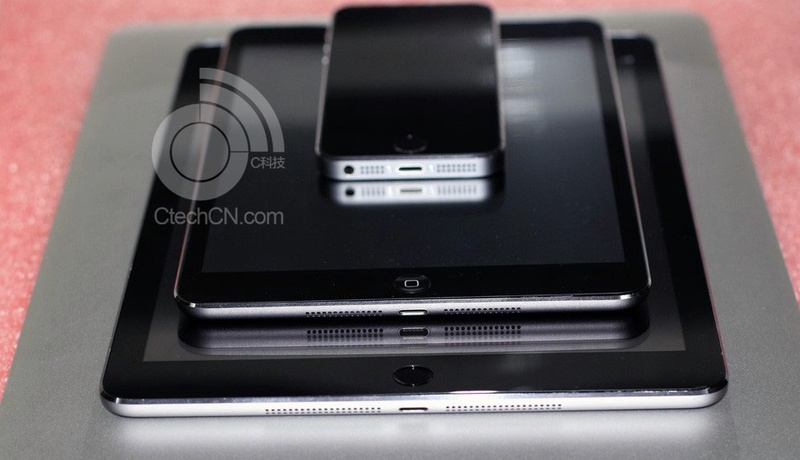 The gold, nay, champagne iPad mini 2 with Touch ID (above) comes courtesy of 2014 News and the stack o’ ithings below, including an iPad 5 with Touch ID, has been published by CTechCn. Neither source has much if any Apple rumor cred, but that could change come Tuesday if these photos are shown to be accurate. And, really, 2014 News, those guys might be worth watching — they’re reporting from the future. However, whereas there is almost no question that Apple will introduce if not ship the iPad 5 at Tuesday’s Apple Event, whether or not it arrives equipped with Touch ID is an open question. Also uncertain is the delivery status of the iPad mini 2 or, as some prefer/hope, iPad mini Retina.